Ironwood is a city in Gogebic County in the U.S. state of Michigan, about 18 miles (29 km) south of Lake Superior. The population was 5,387 at the 2010 census. 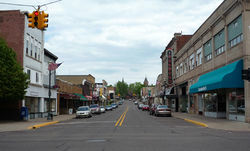 The city is on US 2 and is situated opposite the Montreal River from Hurley, Wisconsin. 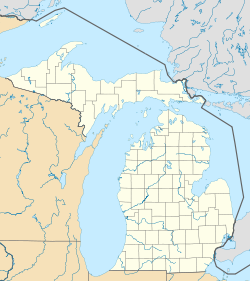 It is the westernmost city in Michigan, situated on the same line of longitude (90.2 degrees West) as Clinton, Iowa and St. Louis, Missouri. While originally an iron mining town, the area is now known for its downhill skiing resorts, including Big Powderhorn, Blackjack, Indianhead, Mount Zion and Whitecap as well as its cross country skiing at the Wolverine Nordic Trail System and the ABR Nordic Center. Ironwood is home of the "World's Tallest Indian" : a 52 ft (15.8 m) fiberglass statue of tribal leader Hiawatha. The city is at the south end of Ironwood Township, but is administratively autonomous. The town of Ironwood was settled in the spring of 1885. The town was incorporated as a village in 1887 and as a city on April 8, 1889. The township area north of the city was incorporated as Ironwood Township on April 8, 1889. In 1890 the population of Ironwood passed 7500 and in 1900 it reached 10000. Iron ore was found in the area in the 1870s but it wasn't until the mid-1880s when the arrival of the railroad to the area opened it for more extensive exploration of the vast iron ore deposits. Soon several mines were discovered and opened such as the Norrie mine, Aurora mine, Ashland mine, Newport mine, and Pabst mine. The opening of the mines and the lumber works in the area led to a rapid influx of immigrants both from other parts of the US and directly from Europe (mainly Sweden, Germany, England, Italy, Poland, Finland). On September 17, 1887, a disastrous fire swept over half of the business portion of the town, although the buildings that were lost were quickly rebuilt. In 1926, the Pabst Mine Disaster took place, killing three miners and trapping 43 more for up to five days. Its name's origin is usually considered to be from the following: James (Iron) Wood was a mining captain who worked for Fredrick Rhinelander. Arriving on the train to this wilderness camp, Mr. Rhinelander named the town in honor of his captain. There's a small park at the corner of North Suffolk and Fredrick Streets in honor of James Wood. Fredrick Street was in turn named after Fredrick Rhinelander for whom Rhinelander, Wisconsin was named. In the early 1960s, the U.S. Air Force established a Strategic Air Command (SAC) Radar Bomb Scoring site atop Norrie hill to track and score simulated bomb runs by B-52s and B-47s on targets in the Ironwood area. It was used for both high altitude and treetop level bomb runs. A monument is erected south of Hurley, Wisconsin to remember those crew members killed in two B-47 low level runs. The site was moved to Charlevoix, Mi. in the mid 60's. The religious life among the immigrants of different nationalities was very active. Already in the early 1890s there were twelve different churches in Ironwood. Ironwood boasts a rich cultural life that includes two theater organizations Theatre North and Ironwood Theatre. Ironwood Dance Company produces shows throughout the year and sends dancers to compete at state and national competitions. The Ironwood Carnegie Library is the oldest operating Carnegie library in the state of Michigan. Each summer the Pine Mountain Music Festival brings top performances to Ironwood. Ironwood and its famous pasties appear in Neil Gaiman's novel American Gods. Ironwood and the Ironwood region are central to folk novel Marvin & Me, by author and Ironwood native Rod Stockhaus. Ironwood's city government, like many other small Michigan communities, consists of a 5-member city council with the top vote receiver serving as Mayor. Day-to-day operations are the responsibility of the City Manager, who reports directly to the council during their two monthly, public meetings. The City of Ironwood operates a public safety department, in which all of the members are fully cross-trained and serve as both police officers and firefighters. Current city ordinances allow for a full-time staff of around twelve. Before 1989, the city had traditional, separate police and fire departments. IPSD, as the department is now known, continues to be the only full-time fire department in the Western Upper Peninsula. The Public Safety Department is also supplemented by the volunteer fire department which has been in operation since 1887. In response to a decade-long rise in tourism, the department now operates a snowmobile patrol unit from December to February, and a community-based foot patrol unit from May to September. Ironwood has one high school, Luther L. Wright High School, informally known as Ironwood High School. Their mascot is the "Red Devils," a common description of the iron ore miners that would get covered with red dust from the iron ore. Luther L. Wright enjoys a rivalry with neighboring Hurley High. It is one of the longest-running interstate rivalries in American high school sports. The school's mascot was the ram, with the players known as the "Ramblers". The student yearbook was known as the "Loner" in recognition of its status as the last parochial school in this part of the state. Ironwood is also the location of Gogebic Community College. US Highway 2 runs west to Ashland, Wisconsin and Duluth, Minnesota, and runs east to Iron Mountain. Business US Highway 2 serves the city of Ironwood. M-28 begins in nearby Wakefield and runs east across the Upper Peninsula of Michigan to Marquette near Sault Ste. Marie, Michigan. Wisconsin State Highway 51 ends in nearby Hurley, Wisconsin. Wisconsin State Highway 77 starts just across the state line in Hurley and travels southwest. County Road 505 runs north (as Lake Road) through Ironwood Township and runs by Little Girl's Point County Park on Lake Superior and eventually meets the northern terminus of WIS 122 at the Michigan–Wisconsin border near Saxon Harbor, and runs south (as Van Buskirk Road) through Erwin Township to meet the terminus of CTH-C in Oma, WI. County Road 200 (Old County Road) begins at the east end of the city and runs east to Bessemer. County Road 501 (Junet Road) begins at the northwest end of the city and runs north to meet CR 204 (Airport Road)}. Indian Trails provides daily intercity bus service between St. Ignace and Ironwood and between Ironwood and Duluth, Minnesota, while Gogebic County operates a small public bus system, Gogebic County Transit (LITTLE BLUE BUS). Ironwood is served by the Gogebic-Iron County Airport (IWD), which provides commercial air service. Air Choice One provides scheduled commercial service to both Chicago O'Hare International Airport and Minneapolis-Saint Paul International Airport. MSP service was added on June 1, 2016. Located (7) nautical miles northeast of the city, the airport handles approximately 5,500 operations per year, with roughly 65% general aviation, 26% commercial service and 9% air taxi. The airport has a 6,502 foot asphalt runway with approved ILS, GPS and VOR/DME approaches (Runway 9-27). The Iron Belle Trail uses Ironwood as one of its terminus's for the cross-state hiking and biking trails. According to the United States Census Bureau, the city has a total area of 6.42 square miles (16.63 km2), all of it land. Ironwood is one of the snowiest places in Michigan, and has an average seasonal snowfall of 188.2 inches (4.78 m). The deepest snow cover, 71 inches (1.80 m), was measured on February 23, 1904. As of the census of 2010, there were 5,387 people, 2,520 households, and 1,408 families residing in the city. The population density was 839.1 inhabitants per square mile (324.0/km2). There were 3,175 housing units at an average density of 494.5 per square mile (190.9/km2). The racial makeup of the city was 96.0% White, 0.5% African American, 1.1% Native American, 0.2% Asian, 0.3% from other races, and 1.8% from two or more races. Hispanic or Latino of any race were 1.2% of the population. There were 2,520 households of which 23.8% had children under the age of 18 living with them, 38.5% were married couples living together, 12.3% had a female householder with no husband present, 5.1% had a male householder with no wife present, and 44.1% were non-families. 38.5% of all households were made up of individuals and 17% had someone living alone who was 65 years of age or older. The average household size was 2.09 and the average family size was 2.72. The median age in the city was 45.5 years. 19.3% of residents were under the age of 18; 8.6% were between the ages of 18 and 24; 21.7% were from 25 to 44; 28.7% were from 45 to 64; and 21.7% were 65 years of age or older. The gender makeup of the city was 48.1% male and 51.9% female. As of the census of 2000, there were 6,293 people, 2,841 households, and 1,625 families residing in the city. The population density was 960.3 per square mile (371.0/km²). There were 3,349 housing units at an average density of 511.0 per square mile (197.4/km²). The racial makeup of the city was 97.52% White, 0.10% African American, 0.72% Native American, 0.22% Asian, 0.14% from other races, and 1.30% from two or more races. Hispanic or Latino of any race were 0.83% of the population. The ancestral makeup of the population were 24.7% Finnish, 17.0% German, 14.8% Italian, 12.6% Polish, 10.4% English and 9.5% Swedish. There were 2,841 households out of which 24.9% had children under the age of 18 living with them, 42.4% were married couples living together, 11.2% had a female householder with no husband present, and 42.8% were non-families. 37.9% of all households were made up of individuals and 20.8% had someone living alone who was 65 years of age or older. The average household size was 2.16 and the average family size was 2.84. In the city, the population was spread out with 22.2% under the age of 18, 7.9% from 18 to 24, 23.6% from 25 to 44, 21.8% from 45 to 64, and 24.5% who were 65 years of age or older. The median age was 42 years. For every 100 females, there were 89.1 males. For every 100 females age 18 and over, there were 86.3 males. The median income for a household in the city was $23,502, and the median income for a family was $30,349. Males had a median income of $26,992 versus $21,184 for females. The per capita income for the city was $14,131. About 17.0% of families and 18.5% of the population were below the poverty line, including 24.2% of those under age 18 and 12.4% of those age 65 or over. The Ironwood Memorial Building is located at the corners of McLeod and Marquette streets. It is a lavish 1923 Beaux arts municipal building. It contains extensive stained glass, murals, original light fixtures, and exhibits of artifacts and memorability on local history. An interesting display on the Gogebic Range's social history is upstairs. Ironwood city offices are quartered there and an ostentatious civic auditorium are in the building. Its main theme is the commemoration of local World War I veterants—1580 Gogebic area men perished in the war. This is one of several ostentatious buildings in the region paid for by copper companies. Copper Peak is the largest ski jump in North America. There hasn't been any competition since 1994. However, it will be renovated and become the world's largest summer ski jump. The City Hall about 1905. The Railroad Depot around 1910. St Ambrose Church around 1910. The Aurora Mine before 1910. The Norrie Mine before 1910. The Newport Mine before 1910. Miners at the Norrie Mine around 1905. Mining scene from Ironwood around 1905. ^ Ironwood, Michigan. The Growing Years 1885–1925. The Centennial edition, 1985. ^ "Ironwood Area School District - Ironwood, MI". ironwood.k12.mi.us. ^ "IRONWOOD-HURLEY-ASHLAND-DULUTH" (PDF). Indian Trails. January 15, 2013. Retrieved 2013-02-28. ^ "Air Choice One to offer flights to Minneapolis". The Daily Globe. Retrieved 2016-04-08. ^ "AirNav: Airport Information". www.airnav.com. Retrieved 14 April 2018. ^ "FAQ about Michigan's Iron Belle Trail". Michigan DNR. February 7, 2015. Retrieved February 7, 2015. ^ Team, National Weather Service Corporate Image Web. "National Weather Service Climate". w2.weather.gov. Retrieved 14 April 2018. ^ "Ironwood 1981-2010 normals". NOAA NowData. 2016. Retrieved on September 14, 2016. ^ "Ironwood Blog". Ironwood Blog. ^ "Ironwood Memorial Building". Hunts Upper Peninsula Guide. Retrieved August 12, 2011. .
^ "Copper Peak to be reinvented as world's largest summer ski Jump". Ski Jumping Hill Archive » skisprungschanzen.com. Wikimedia Commons has media related to Ironwood, Michigan. "Ironwood, Mich." . The New Student's Reference Work . 1914.